Next Article Grain Bags in January – What Could Be More Fun? Great article! I know there are arguments why GM crops are beneficial to agriculture, but I believe another important characteristic of these crops to note is their efficiencies. GM crops are bred to have more efficient use of nutrients, as well as water. This means that we can grown more food with less fertilizer and less water or rainfall. This is extremely important as there is a growing concern about our world’s water supply. If GM crops can decrease the amount of water used, that means less blue water (fresh water in lakes, rivers, etc) is used for irrigation purposes, and it also better utilizes the green water that is stored in the soil. An interesting bit of information is that it takes 50,000 fewer gallons of water to produce an acre of corn today than it did in 1990. Also, we increase sustainability if we can develop GM crops that can more readily access nutrients stored in the soil, and can more efficiently use nutrients from fertilizer products. High yielding crops require a huge amount of nutrients, and not only can that mean a huge fertilizer bill for the farmer, but it also draws concerns about the efficiencies of the fertilizers themselves, and how much of those applied nutrients are actually making it into the plants. GM crops and breeding programs are necessary for the advancement of our varieties that will help us meet the growing food demands of our world. As a farmer, it is very important to me that I can have the best genetics available to me, to help me grow as much of the most nutritious food I can, with the least impact on the environment. After all, I make my living off of the environment, and the last thing I want to do is jeopardize it. You’ve raised some excellent points, Lyndsay. Fertilizer applications are frustratingly inefficient, and the use of genetic modification to improve this is an exciting possibility. This is the hypocracy of the organic/non-GMO movement; we can achieve many of the basic goals of organic agriculture through the use of GMOs. We can reduce fertilizer, pesticide and water use, while still improving the nutrient content of the harvested grain. Consumers need to be aware of these facts to properly consider the benefits of GMOs. Thanks for the reply! How much of the current advances in yield, water use efficiency, Nutrient use efficiency is simply due to the advent of hybrids, and better plant breeding? you mention you could go back to conventional soybeans and open pollinated canola but choose not to. fair enough. But I would love the option of a hybrid Non GMO canola. A good hybrid may actually be more profitable as instead of costing $5-$8 dollars a pound for seed it could cost half of that. If yields where comparable profitability would be better. In my opinion it is hybridization and breeding that has created higher yielding canola (not as familiar with Soy) not as much the GMO factor as we farmers would sometimes like us to think. Also be careful with herbicide rotations growing to much of one herbicide tolerant system will render that system practically useless which is what has happened with the Round up Ready trait in the us Corn Belt. I appreciate the comments, Josh. I will disagree with you on a couple of points, though. To grow a hybrid variety that can compete with current InVigor and Roundup Ready varieties would still require a substantial financial investment. Remember, companies like Bayer CropScience and Monsanto do, at some point, have to be profitable. For a company to produce a competitive, non-GM variety that yields close to the GM variety would, in my opinion, cost closer to $5-8 per pound than you suggest. A good comparison is wheat. The newest, highest-yielding wheat varieties (which are of course non-GMO) cost in the range of $14-17 per bushel. At a seeding rate to establish a proper plant stand, this costs $25-31 per acre, not all that far below canola, and usually less profitable too. I think genetic modification was the catalyst for the explosion in corn, soybean and canola yields. True, genetic modification alone is not responsible for the massive yield gains, but without it, I seriously doubt these crops would have seen the investment by biotechnology companies that they have. You have raised a good point about herbicide resistance. This is a serious issue that I think we need to be very aware of, but it is not due to GM crops that this happened; it is solely a lack of rotation on the farmer’s part. Check out my blog article on this issue at http://jleguee.wordpress.com/2013/12/01/herbicide-resistance/ for my views on this subject. You raise some good points Josh, especially about a hybrid non-GMO canola. The fact is that there are non-GMO hybrid varieties of canola on the market today, and they have some pretty decent genetics as well. All Clearfield canola varieties are non-GMO, and bred through traditional methods. 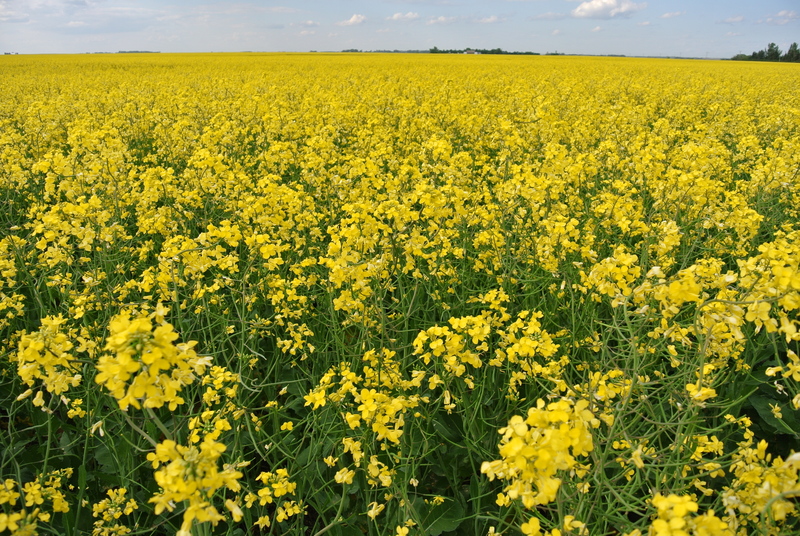 With canola, there are 3 different types of varieties: Roundup Ready, Liberty Link, and Clearfield – all which use a different herbicide system. The Roundup Ready and Liberty Link systems are by far the most popular, mostly because they provide better weed control over the Clearfield system. There are also far fewer varieties on the market in the Clearfield system. That being said, there are several varieties that will perform nearly as well as the top Roundup Ready and Invigor (Liberty Link) varieties, even out-performing them in some years. But the key thing to note here is that the cost of the seed isn’t as much lower than the other systems as you would expect it to be – ranging from $8.50 to nearly $10/lb, as compared to around $12-13/lb for other top GM varieties. And just as Jake mentioned, it still costs these companies ridiculous amounts of money (I wish I had an exact number, but millions per variety isn’t an outlandish statement) to put a variety through the registration process, and this process takes 8-10 years from the time of the initial crosses, plus more years for replication of seed so that there is enough volume to sell (some of this can be fast-tracked a bit by shipping seed to other parts of the world so we don’t have to wait for everything to thaw here in Canada). And we all know that not every variety that is registered is a winner – there are always varieties that come through that maybe aren’t quite what everyone expected them to be (farmers, seed companies, etc). What it all boils down to is that the seed business is an expensive business to be in, and if we want to keep having newer and better seed varieties (be it hybrids or GM varieties) available to us, the money for all of that research and development needs to come from somewhere. And yes, I have to continually remind myself of that as my seed costs increase. GMO seed never increased my yield, quality, efficiency or profit. LL soybeans did control my Marestail problem but I am able to do it just as efficiently with non GMO. For me, there is no advantage. I respect your belief and congratulate you on a well written article. For me, that just isn’t the case. Certified wheat seed is expensive but after on year of certified seed one can grow the second generation of that wheat seed again for comodity price plus .50 cents a bu for cleaning. Bin run seed costs half of certified seed to use. Few farmers grow crops from certified seed every year. Admitedly due to the hybridization process canola can’t be seeded bin run without yeild loss, unless it is an OP variety. Clearfeild though not GMO may as well be as it is a product of mutagenisis basically throw enough radiation at a plant and see if the results are useful. Far less safe than GMO where we know exactaly what changes we have made to the plant if you ask me. Clearfeild may not be GM but it is a trait that is patented and needs to be paid for hence the cost. Seed costs aside good seed is expensive I accept that to grow a good crop I need to pay the price. What about a conventional canola using Edge, muster, sulfentrizone, and all kinds of conventional chemistries for weed control. Sure the chemicals are not as safe for the user, but with good rotation and a good hybrid it could be a great system also the European market would be opened to that canola, which would be a good thing. As far as soybeans lots of people moving back to conventionals in the states as seed costs are less and the RR trait is breaking down with over half of the US States having glyposate resistant weed issues. Soybeans have even way less need to be herbicide tollerant than canola. As there are many good chemistries for Soy. Good safe non selective non residual herbicides such as Glyposate as so rare and special that we nees to show it more respect. Adding even more RR crops to the mix makes it even harder to maintaion the effectiveness of the chemestry. Gm for better N effeciency, or N fixation, or other novel traits other than herbicide resistance would be great. Buy think we have enough herbicide tollerant crops on the prairies we dont need anymore. I’d like to add a couple things to this discussion. First, to properly compare seed costs between wheat and canola, add a seed treatment cost of about $8.50/acre for wheat, since canola comes pre-treated. Second, in some crops, especially malt barley, purchasing certified seed every second year is a good agronomic and economic practice. Therefore, altogether, yes canola is more expensive to seed than other, non-GMO crops, but not by all that much. The reward is also greater for canola in most years. The weed control practices you mentioned would be fairly effective, although sulfentrazone is not registered on canola and could cause crop injury. Consider the substantial increase in cost associated with using these products. While they are an alternative, I would still prefer to see a rotation to other crops instead, such as flax, peas, lentils, wheat, barley, and other crops. This will rotate insect, disease and weed pressure, not to mention the microorganisms in the soil. I think the key point here is that we have barley scratched the surface of what we can do with GM crops. There are incredible opportunities to make agriculture more sustainable, environmentally and economically, if we could only pursue other GM crop options without such severe public backlash. you mention the toxicity of chemicals and their LD50 number but talking to an organic food eater, in the family, she was trying to tell me of the dangerous chemicals GMO foods produce and contain while growing not the pesticides sprayed on them. I have heard other organic consumers mention the same thing. so can you shed some light on this ? Thanks for the question, Garry. While I’m not exactly sure of what your family member is referring to, I suspect it is the Bt gene found in corn for control of Lepidoptera larvae (caterpillars). This extremely selective protein specifically attaches to the gut of the caterpillar, forcing it to stop feeding. Within a short period of time (a few hours or so), the gut breaks down and normal bacteria invade the body cavity, eventually causing death due to sepsis. While this may sound harsh, keep in mind that this protein only attacks caterpillars and has no activity on any other insect or any other animal, and is considered to be incredibly safe for human consumption. I should also point out that although the Bt gene was introduced by genetic modification, almost all plants naturally produce compounds that attack pests. For example, some varieties of wheat (wheat is not a GM plant) contain a gene known as Sm1. This gene causes the levels of phenolic acids (a naturally occuring compound in the plant) to increase when the plant is attacked by the orange blossom wheat midge, an insect that attacks the developing kernels. This increase in phenolic acids eventually causes the midge to stop feeding and the larvae starve to death. This kind of attack on pests (which one could basically refer to as a natural pesticide) is a common feature of most plants. Remember, plants do not have the ability to run or fight a predator the way that we humans and other animals can; they must defend themselves in the only way they can, which is through chemical attack. There are thousands of chemicals produced naturally in plants that are far more toxic than the Bt-corn gene, and yet we have never worried about them. The point I am trying to make here isn’t that plants are dangerous to eat. What I am saying is that the Bt-corn gene is a safe product that has significantly reduced insecticide use in corn production, which is a positive advancement. Always remember that plants do more than stand in the soil and wait to be harvested; they are amazing, adaptable organisms that defend themselves against pests and climate in the only way they can – from the production and distribution of chemicals, some of them relatively benign, some of them extremely toxic to the target pest. So how much did Greenpeace or the Sierra Club pay you to write this comment? Or Millions Against Monsanto? Isn’t that how it works? Let’s hear the honest hard working citizen. See how ridiculous that sounds when it goes back at you? If you really think Monsanto has a big enough budget to pay off everyone that agrees with them, you might want to take a look at their financials and try and figure out how they’d survive. I have never taken a dime from any of these companies to write this blog. I believe if you took the time to read any of my other posts, you’d understand that I value integrity and honesty above everything else. So what’s an honest, hard working farmer’s opinion on GMOs? Just what I wrote in my post.